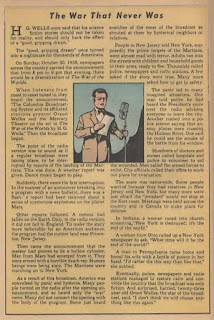 WAR OF THE WORLDS - IN COLOR! H. G. Wells' War of the Worlds is one of my favourite stories. I grew up with Jeff Wayne's musical version and loved it because it was terrifying. 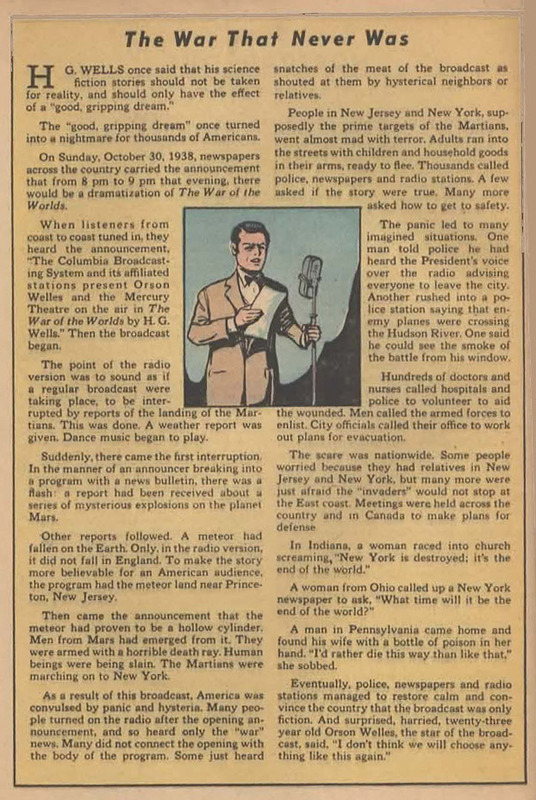 I was fascinated by Orson Welles' radio play and the fact that on broadcast people believed it was real, an early introduction into how powerful the media is. 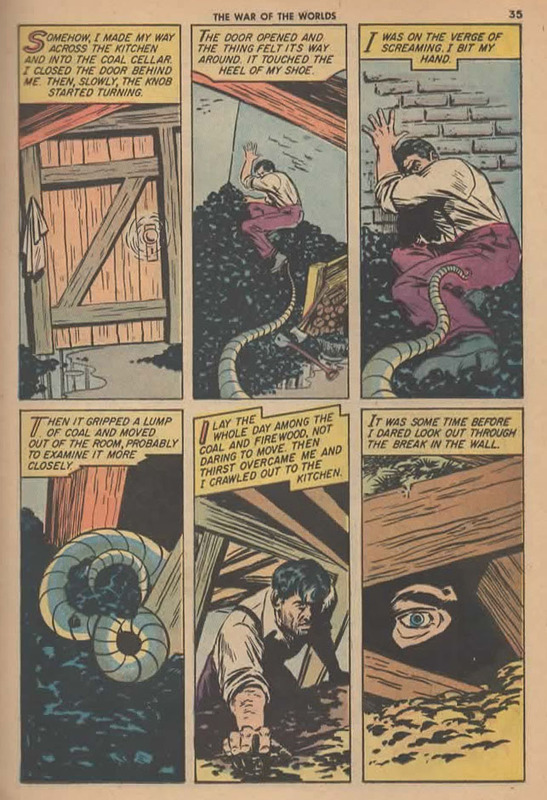 There's a 1970s comic book version drawn by Yong Montano that I thought was brilliant. And then the novel itself, still genuinely scary to read even though you know so many of the events therein beforehand. 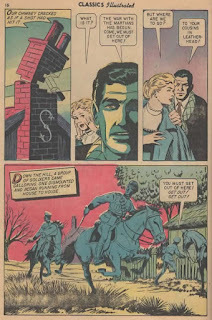 I bought the Classics Illustrated version from January 1955 recently, mostly out of curiosity. 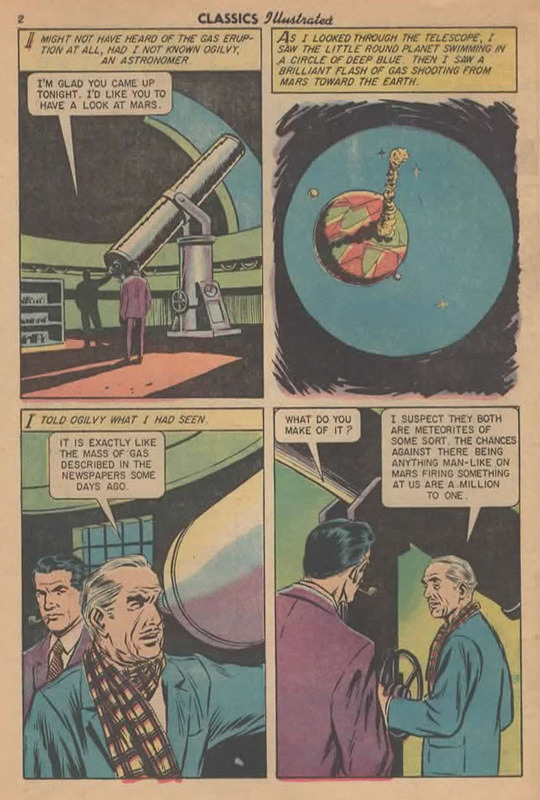 There are no credits, but according to John Gosling's very good War of the Worlds website it's written by Harry Miller and drawn by Lou Cameron. 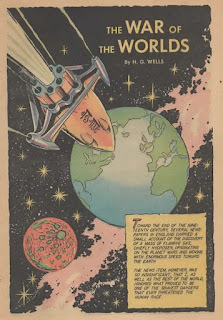 I was immediately pleasantly surprised by the terrific splash page with the spaceship hurtling towards Earth. Click images for larger versions. 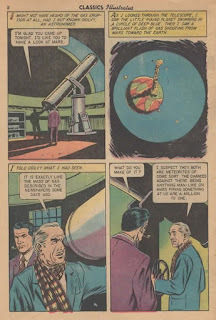 Then, looking at the second panel on page 2, seeing the enormous burst of gas erupting from Mars, and similarly gigantic shadow on the red and green planet surface, I thought I may actually be in for something quite good here. I am very impressed by the colours in this book. It's all standard four colour process, but there are violent clashes to evoke mood. Look at the faces on panel 2 page 10 and panel 2 page 16. This book has shaken up my impression of Classics Illustrated. There's a middle two pages splash and energetic figure movement and explosions throughout. I expected it to be much more staid. Maybe the comic is dramatic because the story is just so good. 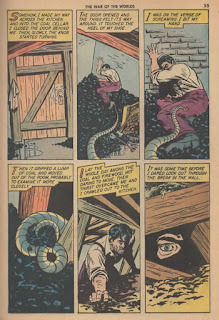 It's hard to imagine not managing to inject any tension into adapting the scene in the cellar with the martian tentacle groping around the room. 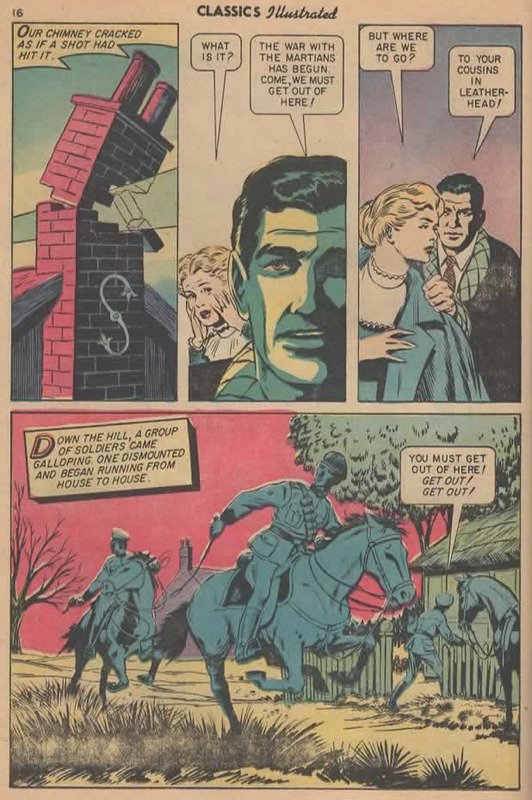 The Classics Illustrated comics are designed to be educational tools. 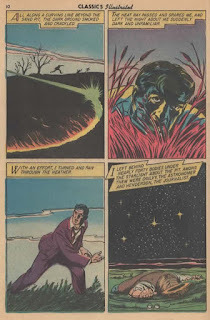 Following this credo, the comic ends with informative articles on H.G.Wells and Orson Welles. 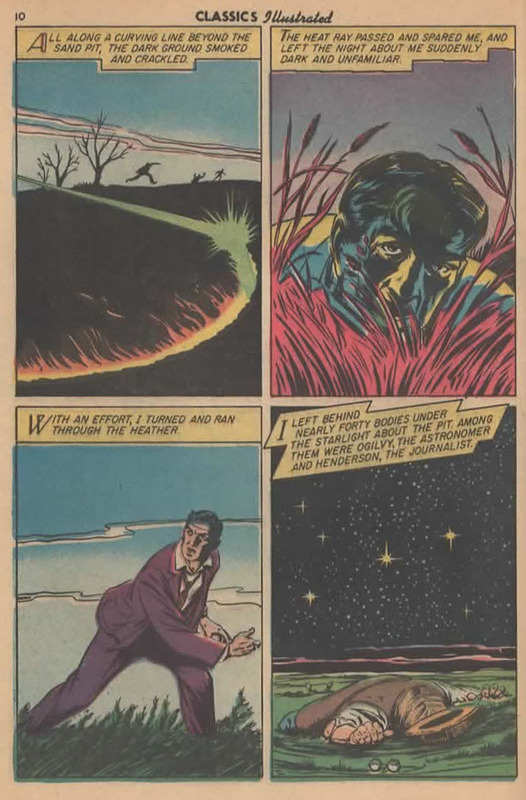 The comic ends with the statement "Now that you have read the Classics Illustrated edition, don't miss the added enjoyment of reading the original, obtainable at your school or public library." Good advice!